Hikvision North America has released two new multi-camera surveillance systems with the PanoVu Mini Series, offering an innovative system for vertical-market applications and more. Each of the new PanoVu mini models includes four cameras in one – three panoramic cameras and a PTZ camera to provide detailed, close-up images. 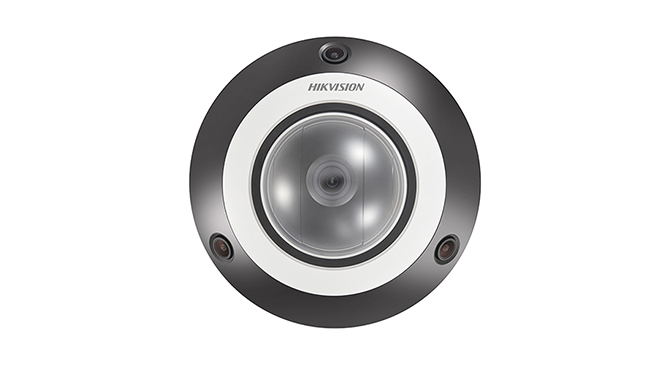 Hikvision’s DS-2PT3326IZ-DE3 PanoVu Mini Series is an 8 MP indoor network camera system with 360° image capture using its three integrated panoramic cameras, and PTZ for incredible, close-up detail. Other features include H.265 video compression, audio input and output, an internal microSD memory card slot (up to 256 GB), and IR with a 33-foot (10 m) range. The outdoor model, Hikvision’s DS-2PT5326IZ-DE 8 MP H.265 PanoVu Mini Series Panoramic + PTZ IR surveillance system, is IP66 outdoor rated and able to capture 240° images with three panoramic cameras, and close-up images with the PTZ camera. Both components feature a progressive scan CMOS and 1920 × 1080 resolution at 20 fps.